Welcome to the Mindfulness and Cardiovascular Health Lab at Brown University! The lab is dedicated to evaluating the effects of mindfulness on heart disease and stroke risk factors, such as blood pressure, obesity, diet and physical activity. It also provides a resource to educate the community on interventions that work, through information shared on this website and in-person programs at Brown University in Providence, RI. We also provide training programs for students interested in being trained in the mindfulness research and interventions. 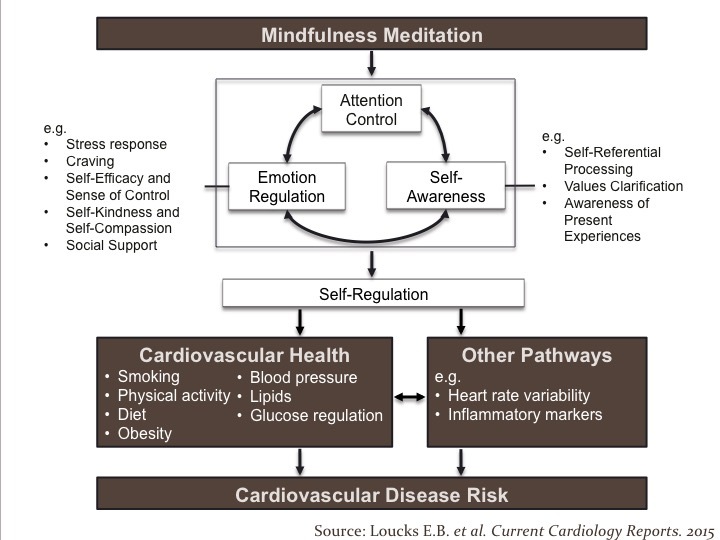 How Could Mindfulness Influence Cardiovascular Health? Do you remember when you were a kid, or maybe saw other kids, who got an itchy bug bite, and scratched and scratched it because it felt so good for a few seconds to do so? Most of us began to realize though as we got older and had more experience with bug bites that scratching actually made them itchier. A lot of us eventually learned to just let the itch be, and if we don't give it much attention, it would fade after awhile, and heal more quickly. In a lot of industrialized nations, we now have a bunch of things that are kind of like bug bites that cause us to itch. We itch with craving. We crave tasty food, often filled with sugar, fat and salt. We might itch to drive to work instead of walk, or chill out and watch a movie, or check out our smart phone instead of doing some physical activity. Maybe we itch to have another cigarette. Mindfulness is a way that can help us cut through cravings. Jon Kabat-Zinn has defined mindfulness as “paying attention, on purpose, in the present moment, nonjudgmentally.” Mindfulness has elements of gentleness, acceptance, and curiosity. What’s happening in this moment? Why am I craving that chocolate chip cookie in my kitchen? Mindfulness brings acceptance to knowing that we crave it for a good reason. Food has never been easier to get, cheaper, or arguably tastier. We have probably never been more encouraged through media advertisements to eat it. Our brains are set up to crave sweet, salty, fatty things, as they are good sources of energy, and the body needs salt for basic homeostasis. Up until a couple hundred years ago, it was not so easy to come across food, so our brains and bodies are still designed to crave and eat it, because our hard wired brain and body don’t know when we will have another chance to do so. With mindfulness, we know that with acceptance and curiosity, there are very good reasons why our brain craves that chocolate chip cookie in the kitchen. With mindfulness, we also know that craving for a particular item is just a thought. If we don’t give that thought a whole lot of energy, it will probably pass in about 90 seconds. Everyone is different, but some of us might start to notice that when we don’t engage in having sugary foods that our energy is more stable, our moods are a little more consistent, and our bodies look and feel better. ​We might also start to notice that our bodies crave rest for a good reason too. Our bodies are designed to move, and until recent generations, bodies had to move a lot just to survive. We needed to physically move to hunt and gather food, engage in farming, getting water, hand washing clothes, building and maintaining our homes, and commuting to our workplace. Some of us still do a lot of this, but for many in industrialized societies, our jobs and pass times have become much more sedentary. We have many entertaining opportunities for rest, whether it is reading a book, watching a show on a screen, checking out email, or even having a meal with good friends or family. Many occupations now are very sedentary, involving computer work, meetings, or other seated tasks. The body still craves rest though, because this is what it is set up to do. In historical times, who knows when we would need to next use our body in a rigorous way, to hunt or gather food, to repair a damaged home, or travel to get firewood or water? It can be healthy for the body to rest when it can, so that it is healed and rested for the next big physical demand on it. Knowing that, we understand that we crave rest for a good reason. However, in this society, how do we deal with that? We can start to notice how the body feels after exercise is completed. Most of us feel good for hours afterwards. How do we feel when we don’t get much exercise? Most of us feel not as good. That’s interesting data. Can we just obtain that data from our own experience in a nonjudgmental, curious, and accepting way? Mindfulness meditation starts to work on a couple of different things that can really help with craving for tasty food, sedentary activities, cigarettes, or other things that influence our health, such as other drugs and alcohol, certain types of social relationships, amongst others. One thing mindfulness meditation seems to improve is attention control (shown in the figure below). This allows us to hold our attention on one thing for longer, such as our breath, or perhaps that feeling we get from physical activity. Can we hold onto those good feelings that almost all of us get after finishing some physical activity? Often our minds move around a lot, and we don’t fully appreciate the wonderful and the difficult things in our lives. Mindfulness meditation helps with this, so that we can hold attention where we want to for longer, and through doing this, we often come to see more clearly what improves our lives, and what makes them worse. A second thing that mindfulness meditation seems to help with is self-awareness (also shown in the figure below). Mindfulness-based interventions often guide you through body scans and mindful movements, and even help you notice where your mind often goes to. Where it goes is very helpful information that tells you a lot about yourself, in nonjudgmental, open ways. Engaging in mindful movements starts to wake up every joint, muscle and ligament in the body. They often have some important messages to tell us. Through this, we start to listen to the messages from our body and then bring our improved attention control to help hold our focus on ways that can help our health and prevent disease. One of the interesting things we found in our research is that those with higher levels of mindfulness had 86% higher likelihood of being in good cardiovascular health, and statistical analyses suggested one of the pathways may be through sense of control (Loucks EB et al. Int J Behav Med. 2015). Perhaps mindfulness enhances our sense of control over our lives so we are more likely to be able to engage in the things we know are good for us, and know make us happy, even if they are always not so easy to actually do.